Dr Robert Farrugia from the University of Malta’s Institute for Sustainable Energy, Jean Marc Pace and Thomas Gauci from Medserv plc, and Dr Daniel Buhagiar and Prof. Tonio Sant from the University of Malta’s Department of Mechanical Engineering in front of part of the prototype that is currently being built. 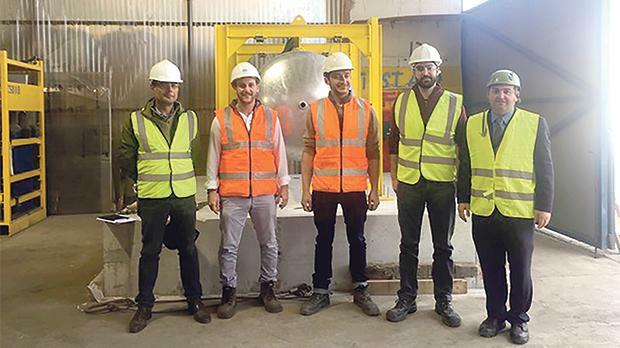 A small-scale prototype of a novel concept for large-scale storing of renewable energy offshore will be tested in Grand Harbour later this year by a research team from the University of Malta’s Department of Mechanical Engineering. The concept developed by Dr Daniel Buhagiar during his Ph.D. research under the supervision of Prof. Tonio Sant involves the use of compressed air. When offshore renewable energy systems such as wind turbines, floating PV panels, wave and tidal systems generate more energy than is needed, the surplus is used to pump air into a closed chamber. This stored-up energy may then be used during times of high demand by releasing the compressed air from the system and passing it through a turbine. A key challenge to this approach is managing the wide pressure and temperature changes taking place during the charging and discharging cycle. To overcome this challenge the system uses a dual chamber approach. Large-scale integration of electrical energy from renewables into the national grid is challenging because of the intermittent nature of the resources. At times, there will be more renewable electricity than required, and in such situations the electrical energy will go to waste. At other times, there will not be enough supply to meet demand, and conventional power plants must compensate. Being able to store energy genertated from renewable sources would address this mismatch in the supply and demand chain. The project, entitled Floating Liquid-piston Accumulator using Seawater under Compression (Flasc), seeks to test this novel concept in the field, to gain practical insights into the performance of the system and to validate existing computational models. The prototype was developed in partnership with Medserv plc and with support from the Institute for Sustainable Energy of the University of Malta. This ongoing research will be presented at this year’s Offshore Energy and Storage (OSES) conference in the US. The project is financed by the Malta Council for Science and Technology (MCST) through the Fusion Technology Development Programme.